The Packers lost two starters on the offensive line to injury in last week’s game, but there appears to be a chance for the starting unit to remain intact for the road trip to play the Giants. C Evan Dietrich-Smith (knee) was back at practice on Wednesday on a limited basis, while RT Don Barclay (knee) did not practice. 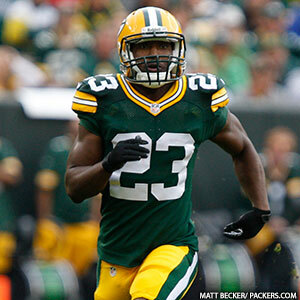 Mike McCarthy said, however, that Barclay was waiting for a brace to arrive and he could try to practice on Thursday. Dietrich-Smith said the scans done on his knee were “encouraging,” and he sounded optimistic about being able to play. 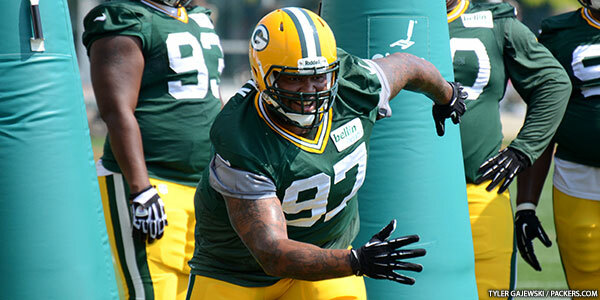 In other injury news, DE Mike Neal (abdomen) is “beat up,” according to McCarthy, and may not practice all week. DE Johnny Jolly (groin), LB Nick Perry (foot/ankle) and CB Casey Hayward (hamstring) also did not practice. LB Andy Mulumba (ankle) and DE Ryan Pickett (knee) were limited, while LB Clay Matthews (thumb) was listed as a full participant. As per team tradition, the Packers select game captains each week. Tonight’s captains will be C/G Evan Dietrich-Smith (offense), DT Johnny Jolly (defense) and K Mason Crosby (special teams). With RB Eddie Lacy (concussion) and FB John Kuhn (hamstring) still not having practiced this week, Mike McCarthy said on Thursday he’s prepared to go into Sunday’s game at Cincinnati with just two running backs — James Starks and Johnathan Franklin — if he has to. McCarthy referred to that game as a “hard lesson,” as the Packers’ only healthy RBs for that contest were Ryan Grant and Kuhn, and Grant had bruised ribs coming in. McCarthy said the game got to a point in the second half where “it was time to run the ball,” but Grant had to sit out a series or two and the Packers didn’t have the firepower in the backfield to make it go. 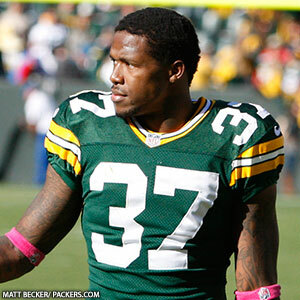 The Packers do have one RB on the practice squad, rookie Michael Hill from Missouri Western, so if neither Lacy nor Kuhn can play, Hill would be a possible third back, but a player would have to be released in order for Hill to be signed to the 53-man roster. 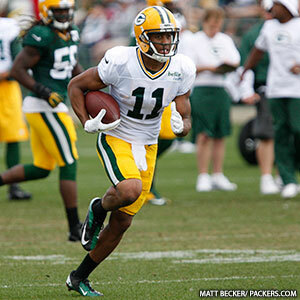 An emergency option would be WR Randall Cobb, who has carried the ball out of the backfield at times the past two seasons, but McCarthy said he’d never put Cobb in a workhorse-type position. It’s also not the plan to automatically sit all of the Packers’ injured players because the bye week is coming up, though McCarthy did indicate S Morgan Burnett (hamstring) is a “longshot” to play this week. In Thursday’s full-pads practice, CB Jarrett Bush (hamstring) joined Burnett, Lacy and Kuhn as a non-participant, while TE Jermichael Finley (toe) and DE Johnny Jolly (neck) practiced but were limited. 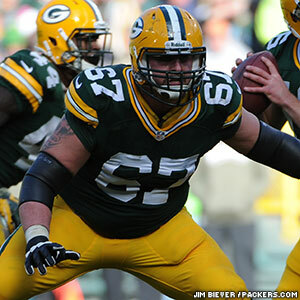 G T.J. Lang (back) was added to the report as a limited participant, but McCarthy didn’t believe his injury was anything serious. For the latest on new backup QB Seneca Wallace and some thoughts from the undrafted rookies who made the 53-man roster, check out today’s feature story. Here are some other news & notes. –Jolly took nothing for granted: From the outside looking in, it appeared Johnny Jolly was a sure bet to make the team after such a strong preseason, but Jolly confessed he wasn’t sure of anything on cutdown Saturday. “I had my phone in my hand all day,” he said. “I was checking it. I was on my toes all day. Making the team after a three-year absence is impressive in itself, and now Jolly wants to contribute to the defense and add to this remarkable story. He hasn’t played in a real NFL game since 2009, when he was a key cog in the Packers’ top-rated run defense, and while he said the long wait was the hardest part, he doesn’t spend any energy looking back anymore at the opportunity he wasted. “I might drive myself crazy thinking about how good I could have been, coming from 2009, which was a good season, up until this point,” he said. “If I worry about that, I won’t be able to focus on what I have going right now. 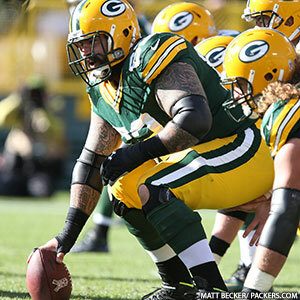 –Barclay starts at RT: It took a while for him to find a home in training camp, as the coaches were trying Don Barclay at backup center and guard, as well as the right tackle spot he played last year. 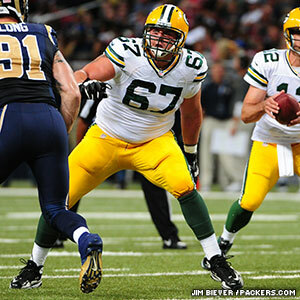 But once Barclay got to right tackle for good, he did his thing. By all appearances, he has won the starting job and will open the season at RT in San Francisco on Sunday, with rookie David Bakhtiari starting at LT and veteran Marshall Newhouse backing up both spots. Barclay said he continues to get more and more comfortable working alongside RG T.J. Lang, after having played next to Josh Sitton last year as a rookie. He said it made a difference to be in his second year because he knew more about what to expect and how to watch film. –Up in the air: McCarthy was non-committal about whom the Packers would use as their primary return man for Week 1, mentioning WR Jeremy Ross, CB Micah Hyde and RB Johnathan Franklin all as candidates. Ross has returned both punts and kicks, while Hyde has worked as a punt returner and Franklin as a kickoff returner. –Injury update: The first official injury report of the regular season will be released Wednesday, but it’s worth noting that two defensive starters who missed the final preseason game with hamstring injuries — LB Brad Jones and S Morgan Burnett — were back on the practice field on Monday. CB Casey Hayward, who also has been out with a hamstring injury, did not practice, however. –Fond memory: New practice-squad QB Scott Tolzien recalled a moment from his pro day workout in Madison, Wis., prior to the 2011 draft when McCarthy, unsolicited, came up to chat with him. Tolzien had just led the University of Wisconsin to its first Rose Bowl appearance in a little over a decade.